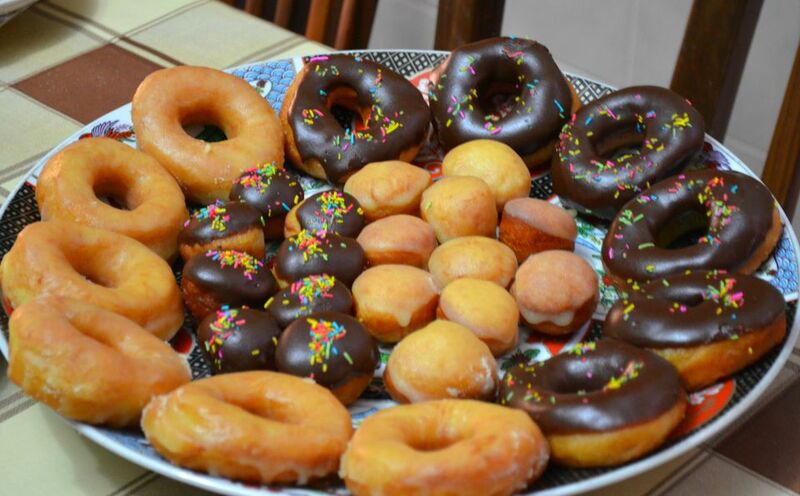 A number of American foods have shown up on the Moroccan fusion food scene, including American-style doughnuts. Lighter and less dense than their French beignet counterparts, and more flavorful than traditional Moroccan sfenj, they're sure to delight family and guests at a Moroccan tea time or breakfast known as ftour. For the best results, the dough must be sticky to the point of being a bit of a nuisance to knead. A heavy-duty mixer with a dough hook simplifies the kneading. Once the dough has risen, it will be easier to work with. The doughnuts can be dusted with granulated or confectioners' sugar before serving, garnished with thin chocolate icing, or dipped in a light sugar glaze. Note: while there are multiple steps to this recipe for American-style doughnuts, it is broken down into workable categories to help you better plan for preparation and cooking. In a large bowl, combine the flour, sugar, salt, and yeast. Add the shortening (or butter), eggs, and warm milk. Stir to combine, then knead by hand or with an electric mixer and dough hook until smooth, about 5 to 10 minutes. Note that the dough should be sticky to the touch (but supple enough to pull or scrape into a mass from the sides of the bowl); add a little more milk or flour as necessary to achieve that consistency. Transfer the dough to an oiled bowl, turn over once, then cover with a towel and let rise until at least doubled in bulk, 1 hour or longer. Punch down the dough and turn it over. Cover again with the towel and let rise a second time until almost doubled in bulk, about 45 to 60 minutes. Turn the dough out onto a generously floured surface. Pat down or gently roll the dough into a rectangle about 1/2-inch/1 1/4-cm thick. Use a doughnut cutter to cut out the dough (or a large drinking glass and small bottle cap to cut out the centers); carefully transfer the doughnuts and their centers to a towel-lined tray. Cover the doughnuts loosely with a towel and let rise for about 30 minutes. Scraps of dough should be gently pinched and pressed together into a mound (do not knead); cover and let rest for 20 minutes or longer before patting out and cutting out remaining doughnuts. Heat 2 inches of vegetable oil in a large pot or deep frying pan set over medium heat. Test the oil by dropping in a scrap of dough; the oil should bubble around the dough, but not be so hot as to brown the dough quickly. Gently slide several doughnuts at a time into the hot oil and cook for 2 to 3 minutes, turning only once, until golden. Transfer the cooked donuts to a strainer or rack to drain for 1 to 2 minutes, then to a paper-towel-lined tray. Repeat with the remaining doughnuts and balls. Warm doughnuts can be rolled in granulated sugar or dusted with confectioners' sugar. Serve warm or at room temperature. Cooled doughnuts can be dipped into a light sugar glaze or thin chocolate icing. Melt the butter in a small saucepan. Stir in the confectioners' sugar, milk, and vanilla. Heat over medium-low heat until thin; add a little more milk to thin it further if you like. Immerse a doughnut halfway into the warm glaze, then set it glaze-side up on a rack to allow the glaze to cool and set. Melt the butter and chocolate over low heat in a small saucepan or saute pan. Stir in the confectioners' sugar and boiling water; heat until thin enough for dipping, adding a little more boiling water if necessary. Gently press the surface of a doughnut into the warm chocolate icing, then place it chocolate-side up on a rack to cool and set. Cooled doughnuts can be frozen after their glaze and icing have completely set. Place them in the freezer in a plastic storage box or freezer bag for up to one month. Thaw at room temperature.